Bing Ads is a paid search advertising platform that businesses can use to advertise online through Bing.com, Yahoo.com, AOL and other various partners. Bing Ads is a major paid search platform with a 33 percent market share, giving businesses the opportunity to reach a large audience not otherwise captured on other paid search platforms. Bing paid ads expands the awareness of small businesses and in return more customers by increasing their online search visibility. Bing Ads are very cost-effective as users only pay for clicks their ads receive and they also gives you a free $100 advertising credit when you spend $25. Your businesses can see lower costs per click, as well as higher click-through rates, on Bing compared to other PPC platforms by taking advantage of Bing’s $100 free credit today. Bing Ads is a pay-per-click, or paid search, advertising platform. They act like Google Ads, where businesses bid against each other on keywords that display their ad in the search results when a user searches those specific keywords. Advertisers pay when users click their ad, which brings users to their website, driving brand awareness and sales through increased search visibility. Of course, the more competitive the search term, the higher the cost per click. 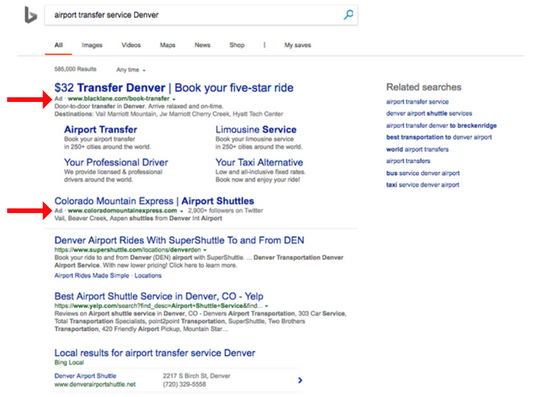 When businesses advertise on Bing, their ads are displayed within Bing’s search results at the top of the page. They can also show on Bing’s Network Partners, such as The Wall Street Journal, CNBC, and Fox Sports. Ads appear in the same format as organic results, with the standard header and body text formatting. The only visual difference between paid ads and organic results is that the word “Ad” is placed before the URL on paid ads. 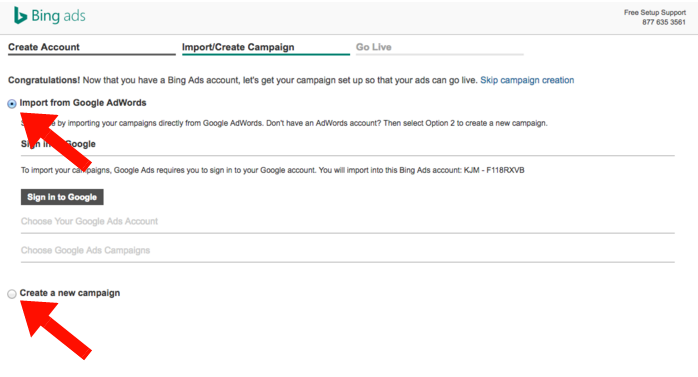 In order to use Bing Ads, you must first establish an ads manager account. This allows you to create ad campaigns, set the ad budget, and specify keywords as well as the max bid per click amount. From there, you make the campaign go live and Bing will auto-bid on your key search terms up to your maximum amount. If you bid the highest amount, your ad will display as the ad result. Bing makes setting up accounts easy and straightforward. Those familiar with Google Ads will likely find Bing Ads has a more user-friendly interface than Google Ads. Like Google Ads, Bing Ads has a number of tools, such as a keyword research tool, to help advertisers strategically plan ads. 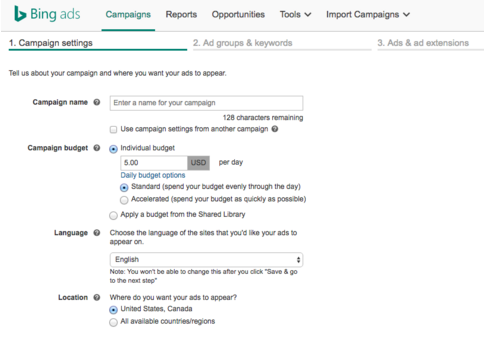 Bing walks you through the campaign and ad setup process. Start building your Bing Ads account with our step-by-step instructions on how to create Bing Ads in 10 steps. Bing Ads is generally a good advertising option for businesses wanting to improve their search rank and tap into the 33 percent of the market not served by Google Ads. Ecommerce, financial services, and businesses targeting an older demographic tend to be more successful using Bing Ads than other industries. However, there is nothing to prevent a business from dividing their marketing budget across both PPC platforms as part of a composite advertising strategy. Bing Ads are on a cost-per-click (CPC) basis, with an average CPC of $1.54 (according to a Wordstream study). However, CPCs can range from $0.20 to over $50 based on factors like market competition and target audience. Bing Ads is an affordable PPC platform, averaging 33 percent lower CPCs than Google Ads. Like Google’s Keyword Planner Tool, Bing has the Bing Keyword Research tool. This provides users with a simple way to research keywords, complete with estimated bids, performance, and search volume (how much competition you have). It even allows you to compare data by device-type and location. However, to give you overall average CPCs regardless of location and device-types for this article, we have used Wordstream’s CPC benchmarks. Bing makes it easy to start using Bing Ads to grow your business. Their easy-to-follow site walks you through the setup process, prompting you to build campaigns to quickly get your ads live. You can get started advertising on Bing Ads following our 10 simple steps. 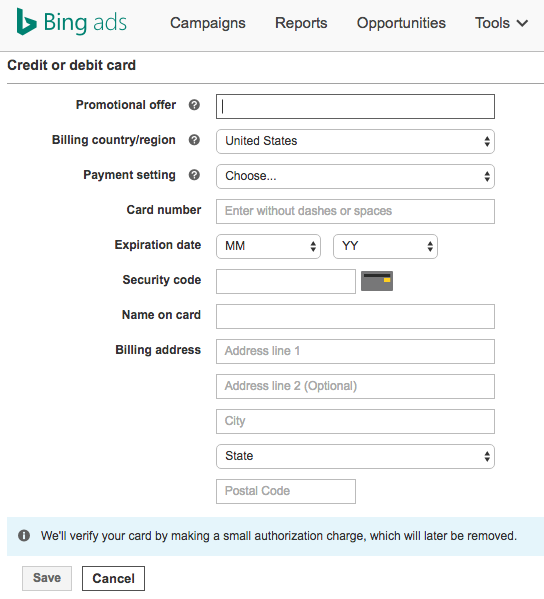 Bing offers a $100 advertising credit when you spend $25. To get your free credit, simply visit Bing Ads and follow the prompts where it asks for your information. You will then be provided with a promotional offer code, which you can input as you complete the billing information page in step 9. Get started advertising on Bing with your free $100 advertising credit by visiting Bing Ads today. Go to Bing Ads and signup for a new account by clicking on the “Sign up now” button in the upper right-hand corner of the screen. Then select the “Create a new email address” from the options (as illustrated below). 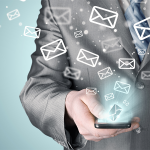 Follow the prompts to input email address, name, and advertiser information. If you have an existing Google Ads (formerly AdWords) account, then you will have the option to import your data from that account. Select “Import from Google AdWords” if so. If not, select the option below to “Create a new account” to build a new account without importing data from an existing AdWords account. 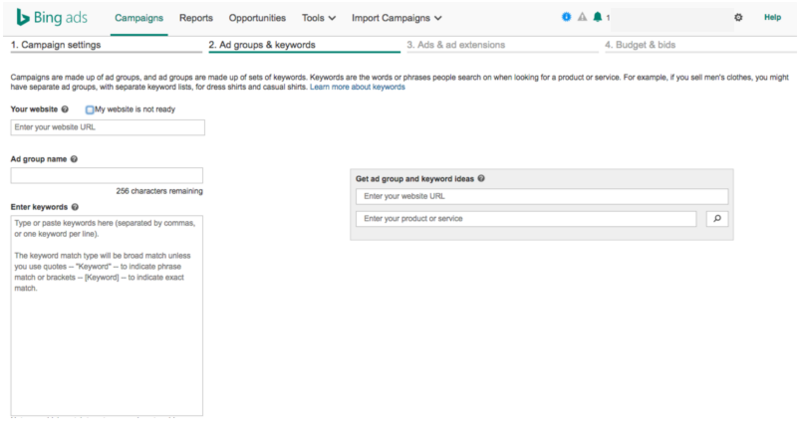 Before you begin creating campaigns and ads, you should do your keyword research using Bing’s keyword research tool. The tool will show you estimated bids and search volume data, providing insight on keywords with high traffic, level of competition and frequency of clicks. The tool will provide you with suggested keywords based on your keywords and URL. Choose keywords that are a good fit for your business. For example, a bakery wouldn’t want to bid on keywords involving the word recipe, but might do well with terms such as “wedding cake designers.” A bakery might want to bid on “order Thanksgiving pies,” but wouldn’t necessarily want to bid on “Thanksgiving desserts,” as users aren’t likely to be searching for a bakery, but ideas of items they can make themselves. You will need to create your first campaign. Advertisers typically have a number of campaigns for different areas of their business. For example, a law firm might have campaigns by area of practice from family law to corporate law, with ad groups breaking out the campaign further, such as divorce and custody services under the family law campaign. Follow the prompts and input your campaign settings. Your campaign name will only be visible to you and is used to easily identify the campaign. For example, an auto dealer might break out their campaigns by vehicle make, model, year, etc., or a cafe might break their campaigns out by breakfast and lunch. Set your maximum daily budget (divide your monthly budget by 30.4 for the average maximum daily budget) and choose a language. Location targeting determines where your ads are shown. Businesses that serve local communities would be advised to choose specific locations to target to ensure that ad spend isn’t wasted on clicks from users who are too far away to likely become customers. For example, a sport fishing charter company in Sarasota, FL, wouldn’t usually want to have their ad shown to users in Colorado. After choosing locations to target (and exclude), below you will see the “Who?” option. The first will only display your ad to users searching from the locations you chose. The second will display ads to those searching in your locations of choice as well as those searching from elsewhere showing an interest in your location. This can be useful for businesses located in touristic locations or tourism-based businesses. Ad groups are a subset of your campaign. For example, an auto dealer might have their campaign be by body style. Under the SUV campaign, an ad group could be Jeep, as it is a category under the campaign. Using the keywords from your keyword research, create ad groups broken out by things such as products, services or locations. Keyword match-types tell Bing when a user’s search should trigger your ad. Remember: most users won’t necessarily be searching your exact keyword, so by choosing to have your ads shown when users search variations of your keyword will give your ads the opportunity to increase search visibility. 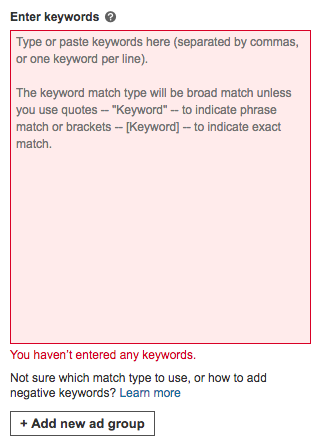 Typically, the broader the keyword match-type, the more results. However, this may also yield lower quality clicks. Typically new accounts will use broad match or broad match modifier match-types to gain the highest amount of search visibility, and as accounts mature and collect data, advertisers tend to move to phrase and exact match to help optimize their keywords. If you’re still not sure which keyword match-type best suits, Bing details keywords match-types and how (and when) to use each. Select the +Create ad button. A pop-up will then appear, and you will be prompted to complete the form. Input the URL of the webpage you want the ad to direct to, then input ad copy in the title part I, title part II, and the ad text. As you input the text for your ad, you will see on the right how the ad will look to users. Finish by clicking “Save” at the bottom left of the screen. Ad copy should clearly state what your business is, along with any unique selling point or call to action that incites users to click your ad. Put yourself in the shoes of the person searching and consider what makes them click one search result over the next. Include your keywords (or search terms) in the ad copy. Concisely explain what your business is. Give users a clear reason to click on your ad. This ad is good because it has a clear call to action (Send flowers in Dallas), giving users a clear understanding of what the business does. It offers a discount, or incentive, to choose them, as well as uses copy in the body of the ad to further give users reasons to choose them. This ad is an example of poor ad copy as it doesn’t provide the user with much information. We can assume it’s a florist, given the name and brief description in the body, but the only call to action is “shop ProFlowers,” without giving users any reason to choose them over the alternatives. It’s a standard paid search rule of thumb to create three variations of each ad in order to discover which speaks best to the user; you will then later be able to optimize ad spend around top performing ads. Each ad should only have a slight variation, for example, to test which call to action is the most effective, keep all ad copy the same in each ad except for variations of the call to action. When a user searches Bing, the ads will display links below the ad where users can click and go directly to the result they’re seeking. Extensions typically see higher click-through rates and give advertisers the chance to include more text. For example, an automobile dealership may use vehicle makes as site link extensions so users searching for a specific make, such as Dodge or Honda, can go directly to a page with those cars. Entering maximum keyword bids lets you decide how much that keyword is worth to you. Also, by using different keyword bids, you focus ad spend towards certain keywords. For example, a plumbing company may want to include keywords promoting their emergency services, but if their focus is attracting commercial plumbing clients, then they would want to lower the bids on emergency services to give more ad spend to the commercial plumbing keywords. Select “Add payment method” from the pop-up that appears after saving your first campaign. Follow the steps to input your billing and payment information. Also, enter your promotional code from step one into the “Promotional Offer” box to use your $100 free ad credit. 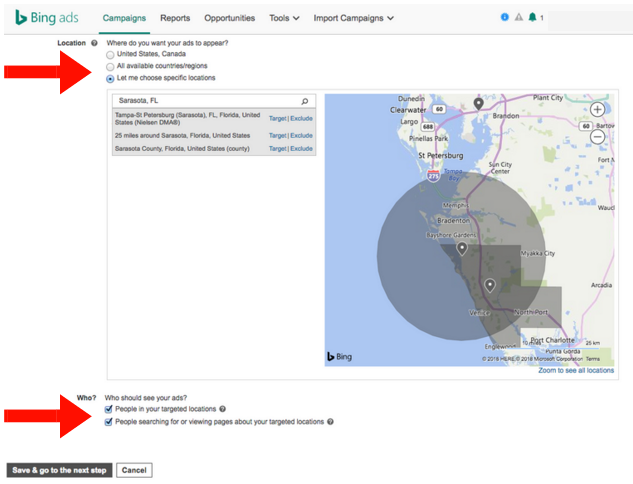 Once you have built your Bing Ads account, you will then want to monitor and optimize it over time to ensure the account is adjusted to maximize your monthly ad spend. Generally, a new account should be given around 90 days to start collecting data, which can then be used to make strategic decisions. Account optimizations are all about finding ways to better allocate ad spend to improve performance and maximize your budget. Yext’s Traffic Booster is a tool that optimizes bids and matches keywords to the most relevant landing pages in real-time to help make your campaigns highly effective. 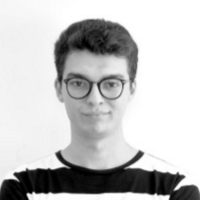 The Yext Traffic Booster uses technology to monitor your account 24/7—giving advertisers a hands-off way of constant ad optimization, saving them a lot of time as well as advertising money. Advertisers may find that some keywords outperform others, as well as some keywords that perform much worse than your average. Discover your worst-performing keywords by evaluating and comparing the performance of each, and then remove your worst-performing keywords. Poor performing keywords will typically be those with the lowest conversion rate, low click-through rates, and high CPCs. In short, they’re the keywords that waste ad spend. Negative keywords are words that are often searched with your keywords and they let you decide when not to show your ad. For example, a pet supply shop named Heads & Tails finds that their ad keeps displaying when users search for Heads & Tails Pub, so they would add the word pub to their negative keywords list to avoid their ad continuing to display for those searches. Review the performance of ads and remove those with the lowest click-through rate. Click-through rates are the most telling of the quality of the ad copy (where your best ads will have the highest click-through rates). Remove your worst performing ads to allow the budget to be focused on your best ads. It’s worth continuously testing new ad copy. Base new ads off your best existing ads with minor changes to test potential areas of improvement. A slight change in wording can have a big impact on your click-through rate, and the ads that speak most to users aren’t always what businesses think they would be. You will find that some locations outperform others. Consider adjusting your bids by location to either increase or decrease your bids in certain areas to help maximize your ad spend. 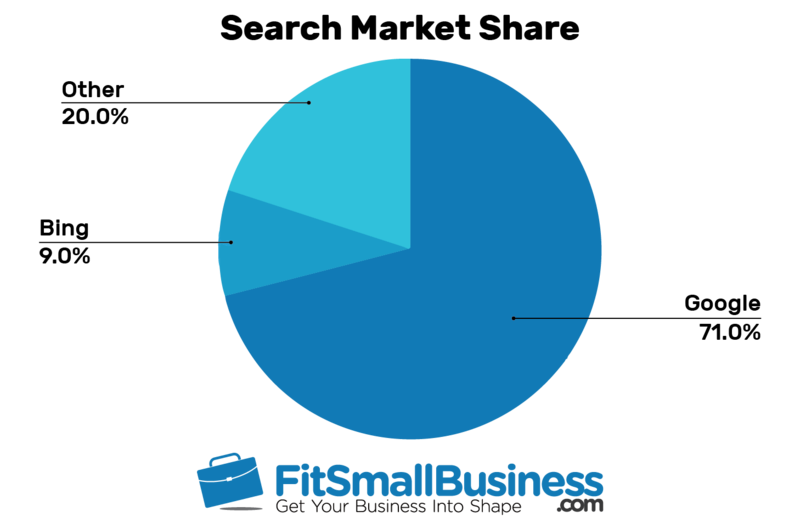 For example, a property maintenance company might serve those within a 30-mile radius of them, but the majority of their best clients are located within five miles. They could increase the bid on locations within five miles of them while decreasing the bid on locations over five miles. Keywords are constantly changing, so you will want to monitor your maximum keyword bids and set your bids accordingly. You may find that some keywords become more expensive than they’re worth, while others see a high return on ad spend, making it worth increasing the maximum bid on them. Ad schedules allow your ads to show during days and times of your choice, and most advertisers find that certain days perform better than others. Increasing bids on days/times with the highest conversion rate will allocate more of your budget to the best days, thereby potentially yielding more clicks without increasing the budget. See how well your ads compete with other advertisers’ ads using Bing’s auction insights report. To determine ad placement when a user performs a search, Bing runs an ad auction. The auction insight report provides data on metrics such as impression share and ad rank. If you find that a competitor is outranking you, consider what their ads are and what they’re doing differently. Bing Ads are simple enough to set up, but many businesses choose to leave their paid search in the hands of pay-per-click advertising professionals to save them time and ensure the effectiveness of their ads (and ad spend). Professional PPC management companies can make your PPC advertising more effective—making them a worthwhile investment. We’ve written an article on the Six Best PPC Advertising Companies to help you find the best for your business. The main advantage of advertising with Bing Ads is that their lower CPCs (approximately 33 percent less than Google Ads) means your monthly ad spend will go further and yield more clicks and conversions. Lower cost aside, Bing paid ads are typically clicked on by an older, more educated demographic, making them a great choice for businesses with matching target audiences. Bing’s low cost per click and high average click-through rate (about 50 percent higher than the average CTR on Google) means that your monthly ad spend will be maximized with Bing Ads. The lower your CPCs, the more clicks you will receive at your monthly ad spend. Increasing your number of clicks equally increases your opportunity to gain new customers—the ultimate goal of PPC advertising. Bing offers advertisers more sophisticated audience targeting options than other paid search platforms such as Google with age and gender targeting features. Bing Ads targeting features also include bid adjustment by age and gender, giving advertisers added control and optimization capabilities for better ad performance and to maximize ad spend. The majority of Bing users are performing searches with a high degree of intent, meaning they are ready to buy, which is good news for any advertisers reaching their target audience. Computers (desktops and laptops) are known for having the most engaged users, compared to those passively searching from tablets or mobiles devices. The majority of Bing users search from computers, whereas on Google, over half of searches are performed on mobile devices. Bing Ads have lower overall search volume than competing Google Ads, but their CPCs account for this difference and can also mean less competition for top ad placement. Bing Ads’ older demographic may not be ideal for businesses geared towards young adults, who make up a large percentage of Google’s search demographic. Bing Ads get 5 billion searches per month compared to Google’s over 24 billion searches per month. Lower search volumes mean lower visibility, but Bing Ads have a higher average click-through rate. Therefore, the decreased volume does not necessarily equate to fewer clicks. Bing actually offers an untapped market to those who have exhausted other search networks, such as Google, with 66 million users. Bing users tend not to be as quick to try out the latest technology or the newest service on the market. What this might mean is that Bing users tend to be more cautious when it comes to their purchasing behavior. This attributes to their increased likelihood to make a purchase, as they’re more likely to be ready to buy, as opposed to those in the early stages of shopping around for the latest (unknown) product. Bing Ads does not offer a display network option. Bing ads only appear in Bing search results or on Bing’s specified partner networks, such as The Wall Street Journal, CNBC, and Fox Sports. This decreases potential search visibility as ads are shown in fewer places, although it also gives advertisers more control over where their ads end up and allows advertisers to be more strategic in their choice of ad copy. Bing Ads and Google Ads are both major paid search advertising platforms, although they are not without major differences. Each platform has differing search volumes and competition with correlating costs. Most importantly, Bing Ads and Google Ads each have very different audiences, making them each better options based on businesses’ varying target audience. Bing’s average cost per click can be up to 70 percent lower than with AdWords, but average closer to around 33 percent of the CPC. Even at one-third of the CPC, that means your monthly ad spend goes 33 percent farther than with Google Ads. Learn more about Google advertising costs for a more comprehensive cost comparison. For example, let’s say your monthly ad spend is $1,000 and your average CPC is $1 on Bing and $1.50 on AdWords. You will get 1,000 clicks with Bing Ads, compared to just 666 with AdWords. With an average conversion rate of 3 percent, Bing paid ads would yield 30 conversions per month versus 20 on AdWords. Google Ads has a much higher search volume; however, more search traffic doesn’t always equate to more clicks. There is also more competition. In addition, Bing currently has 34 percent of the desktop search engine market share worldwide; there are 5.4 billion monthly searches conducted on the Bing Network, totaling 136 million unique searchers. Therefore, Bing Ads reach 63 million searchers that aren’t reached with Google AdWords. Click-through rate is the number of times your ad was displayed compared to the number of times it was clicked. 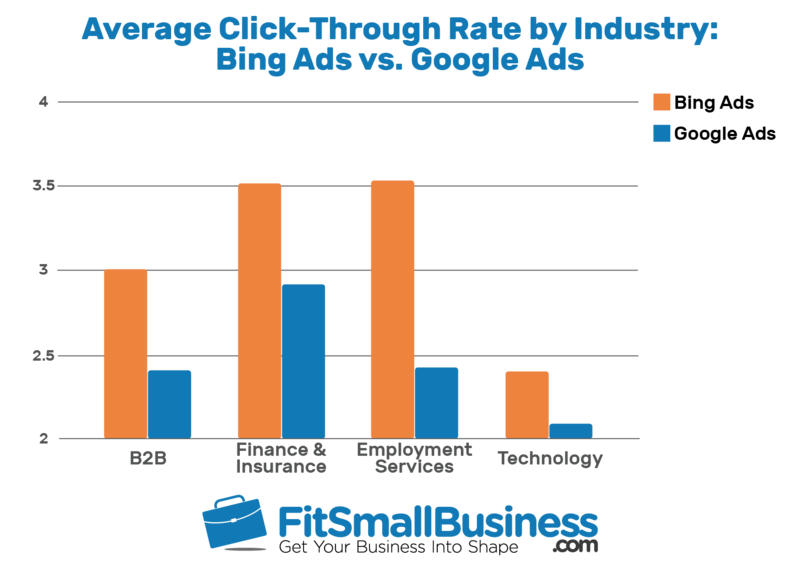 Bing Ads has an overall higher average click-through rate than Google Ads, illustrating that Bing Network may have more motivated users and are therefore more engaged. Bing has the industry’s highest click-through rate in the shopping and financial services industries, which may be a result of Yahoo and MSN being a part of Bing’s Network. It’s a tie when it comes to analytics between Bing and AdWords, as they both link to Google Analytics for data and reporting. From Google Analytics, advertisers can see data in addition to the Bing Ads and AdWords platforms. Google Analytics provides data on site metrics such as the number of page views, amount of time on page, bounce rates, and more, giving advertisers more insight into their PPC performance. Bing Ads has more audience targeting features than Google AdWords. While paid search platforms, such as Bing Ads and Google Ads, pale in comparison to social PPC, such as Facebook Ads’ comprehensive audience targeting options, Bing Ads allows advertisers more options to target their ads to specific audiences, gaining the advertiser more control of their ads and increasing their ad’s relevancy. Bing gives advertisers the ability to target further at the ad group level than AdWords. Sophisticated ad group targeting can help improve ad performance when used fully. It can allow advertisers to create more highly-tailored ad copy, resulting in higher click-through rates. Bing Ads has a great list of partner networks, including The Wall Street Journal, CNBC, and Fox Sports. By using the Google Ads network, your ads could land on a number of sites you’ve never heard of. Knowing where your ads are displayed allows you to better optimize your ads for those platforms. For example, a wealth planning firm would want to advertise in The Wall Street Journal, whereas a sports paraphernalia shop would be well-suited for Fox Sports. Google Search has a primarily young user demographic. Demographics alone are neither good nor bad, but they are very important as the businesses that understand the demographics of their target audience can choose the paid search platform that best reaches their desired market. Bing Search has a primarily older user demographic. This also is neither good nor bad, but is key in determining where your target audience will be best reached. For example, a high-end traditional furniture company would most likely find Bing Ads more effective in reaching their target audience. The majority of Bing users are searching on a desktop or laptop. This may not sound important, but devices can greatly impact PPC performance and your overall return on ad spend (ROAS). Users searching on computers often lead to more action and purchases, making them the best device for businesses selling online. The majority of Google searches are actually performed on mobile devices. Device-type matters as it impacts how your ads can reach the right prospective customers. For example, local businesses do well with mobile searches as users often search for things like “hair salons” or “cafes near me” to find places they are looking to visit, meaning they are very actively searching for your services. Yes. Bing Ads is a good PPC platform for small businesses to use to gain search visibility without requiring a large investment. Even those already advertising on Google Ads will find it advantageous to advertise on Bing because Bing opens up an additional 66 million users not on Google—dramatically increasing your search visibility. How Can I Track Calls from Bing Ads? Advertisers whose goal is to get more phone calls or those that have call extensions can easily track incoming calls from their Bing Ads by setting up call tracking with services such as CallRail. This allows advertisers better insights into what happens after a user places a call from your Bing Ad. Calls are recorded with data such as call length tracked to give insightful insights into your account’s performance. Learn How to Set Up Call Tracking with CallRail. How Else Can I Get More Website Traffic? Maintaining an online presence is critical—it’s how many businesses get the majority of their business. 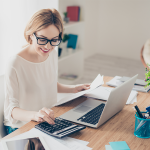 Utilizing services such as Yext help boost website traffic through online business listings, giving businesses another outlet for additional online exposure. Can I Use Both Google Ads and Bing Ads? Yes. Many businesses advertise on both Bing Ads and Google Ads to gain maximum exposure online. If you’re already using Google Ads, Bing Ads makes it very easy to set up your new Bing account by importing your account data from Google Ads. Bing Ads is a great paid search platform for businesses to advertise on to attract new business at an affordable price. There’s no risk in trying Bing Ads, as you only pay when your ads are clicked and getting started is easy. Bing Ads is a growing marketing channel that businesses already using PPC (as well as those new to PPC) could benefit from. With over 30 percent of the search engine market share and 5 billion monthly searches, there is huge potential to reach your target market and motivated buyers with Bing Ads. Click on the button to get started and receive a free $100 advertising credit for Bing when you spend $25. You have shared very helpful information related to bing ads, Your all given stem is very helping and friendly to create ads for bing search engine result page. really nice. But i had a question for u. I already use google. now i will add bing ad in future. Any problem is there. Running both Bing and Google ads is not a problem. If you have the budget to do both, it’s actually a good idea because you can compare which platform you are getting a lower cost per conversion. Bing is really an important way to grow your business. I call it 2nd google because of their quality service. From recent 1.5 years bing improved their policies rapidly and they are giving their customers huge benefits to run their business and get targeted buyers. This article helps us to know more about how bing can give our business a flow. I would like to thank you for sharing such important article. Glad you enjoyed the post and thanks for your input!